Well the reason I ask is on a MP modded VNB I have a pic of he relpaces two ferrinte beads with inducors, not sure what value, they are right next to pins 9 and 10 on the VNB crt socket. yes i know this thats why i was wondering about the inductors Mike uses on the VNB. Caps are not always caps. There is a point where, as the frequency increases, the cap actually becomes an inductor. Kemet has a neat software program that will plot the impedance vs frequency of some of their caps. It will even let you add series resistance/inductance (trace length). This is alot of fun to play with. Here are plots of 1206 size 100nF and 1nF caps. Notice the impedance of the 100nF begins to increase after 12MHz! The 1nF cap looks like a better decoupling cap up to 120MHz. "Were we directed from Washington when to sow and when to reap, we would soon want bread." I have noticed over the last year a growing number of bad convergence boards. Of course the machines with these boards are averaging around 30K hours so this is not really a board problem but simply a maintenance issue. I also remember a lot of posts over the last couple of years where people are seeing some degree of drift with convergence and this isn't normal either. Well the other day I decided to order replacement caps for convergence boards with the intent on replacing them regularly as a standard maintenance procedure, just like those 2 undertaed caps on the VNB's. Well to my surprise, I found the factory de-rated the big power caps on this board between 1995 and 1996 on up. the original spec was for a 400v rated cap, and after 95 they started using a smalled 250v cap. If you look on the newer boards you will see the foot print silk-screened on the board is for a much larger cap. So my advice is re-cap thos C-boards for stable convergence. the original spec was for a 400v rated cap, and after 95 they started using a smalled 250v cap. If you look on the newer boards you will see the foot print silk-screened on the board is for a much larger cap. Good spot! Just had a look and the board is exactly as you said. Convergence drift is one of my pet paranoia's about crt - anything I can do to avoid it is a high priority with me. I'm sure MP said (or inferred) that changing the caps on the Convergence board made little difference but I often wondered about this as changing caps elsewhere does (as we know) make a big difference! Presumably he simply meant on pq in which case it would indeed make no difference. Anyway, the replacment caps, keep them at 10uf or worth a slight increase? Draganm you must be reading my mind or some how been watching me in my work shop!, The last few days i have been doing the VDM caps and the CVA caps, I up rated the voltage on all and used the Panasonic FM and FC series, I am going to do the write up but am waiting for the right resistors to come in first. I have already changed the caps on the VDM with FC and FM caps and these are a lot bigger so it took some creative work to fit them in there. I used 100v for all on that board i think. I also have all the caps for the CVA a I think I have the 10uf at 350 volt versions, i dont think thses are fc or fm as i dont think they go that high, I am at work now and going off memory. Paul I think the caps wont help the convergence drift as much as the resistor change, the resitors you need should have a good temperature coeficient, meaning they are stable in a wide range of temp changes, that is what causes the drift as Mike parker states. he took a can of freeze spray and sprayed them on the resitors he mnetions and the grid moves a lot, i tried it on both the caps and resitors and when hitting thos resitors tthe grid moves. Blimey! An extreme test but one that proves the point! I knew that temperature played a part but hadn't realised just how much impact it could have. I look forward to your 'How To' Athanasios. In particular the chosen type of resistors - I'm pretty sure you'll be well aware that many folks have found it fruitless trying to locate MP's recommended resistor for the mods on these boards. Even trying to work out exactly which resistors were the right ones to be used has been subject to much speculation. You've just uped the ante again by throwing in temperature considerations! I've not had much change from doing the caps on the convergence boards. The changes I've noticed were from the fusible resistors (small) with the best changes and improvements being cleaning ( alcohol or other solvent) the heat sink isolator strip, and putting a slight coat of patroleum jelly on both sides of it. Once done, that rear heatsink should run much hotter.. Thanks for chiming in Mike ! It does look like they have better caps on the CVA then the VDM, and thanks for the tip on the petroleum jelly, i have heat sink compound I plan to use. I didnt notice befoer in your MPMT you put it on both sides thanks ! These are the 1/2 ohm half watt fusibles i used for both boards. ok, so maybe the drifting and board failures are not related. It seems like there's been more failures lately of the transistors on the C board and it causes one of the 2 amps on each channel to fail. I assumed it was leaky caps contributing to this? Interesting, I suppose they just lowered the the value (capacitance and voltage) of the parts to what they could get away with rather than what was actually needed. No different from a lot of other business companies I suppose. Thanks for raising this draganm, its shed much needed light on an area often ignored. These last few posts have been snippets of excellence, kudos to MP and Athanasios! Interesting, I suppose they just lowered the the value (capacitance and voltage) of the parts to what they could get away with rather than what was actually needed. No different from a lot of other business companies I suppose.! the capacitance stayed the same at 10Uf, the voltage rating dropped though, probably to save money like you mentioned. At an avergae of 30k hours it's probbly a good idea to replace them anyway. the caps are always the Achilles heel of any electronics device. there's a lot of stuff in this thread I want to try but time is such a luxury in short supply. Luckilly I have an MP video chain in my machine for many years now, even though they're an older version they still blow away a stock machine. Odd question of the day - what size soldering tip you guys using for these mods? I generally use a 1mm tip but thinking of going to 0.5mm, just wondering. For some odd reason I've been finding it difficult to de-solder stuff with the new tip I'm using and wondered if a change in size might help (may just be a bad tip as the problems only started when I put it on a couple months back and when I just soldered something just now it didn't go quite as well as it should and I remembered that I'd had problems with this tip before. I've got spares but wondered what others are using size-wise. paul if you plan on doing more work on the boards i'd get a station, unless you have one already, i have an Aoyue 968 and love it I also got a tweezer iron that makes removal of thos SMT ceramic chips a breeze! And the hot air gun is great for removing the chips, especially if the ic popper tool they give you fitts under the chip pins, you slide it under, heat up the chip with the gun and it pops up! awesome!!!! I just got the 1/2 ohm fusible resistors and am in my shop as I type working on the VDM. post to follow soon. On aside note I did the rework of a VNB to accept a sony pinout Hybrid tube, so now we can use sony tubes too, i am looking for a few sets of VNB's so i have both on hand ! I've got myself a decent Soldering Station but I've never heard of Soldering Tweezers or IC Poppers! No wonder you whizz through these mods I'm using stone age tools whilst you are using precision instruments, FFS. I like the idea of the tweezers and the popper - I'll try to get some that will fit my station. The soldering iron plug looks the same, a 4 pin screw-on thing. Mine has 5 pins, yeah when Andre asked for me to do his CLM i though damn thats a lot of work!!!! So i found this fairly cheap, its really nice for the amount of cash. 5 pin, ok, looks like I need the whole unit then (tweezers and its own station), worth it for the hassle it will save though! easier. If you want to make it easy you can do the same with a sharp blade. work as we will do it all at once then install. maintenance thread on AVS. It was a "nugget" he revealed to us ! thanks Mike ! the ones i ordered from Mouser. there are 12 more of these on the CVA also but that is later. would be a bit too low, and the service manual lists 1 ohms, hmm what to do? I also decided to replace the resitors on the +/- 5 volt rail as these too are the "mickey Mouse"
I think it be easier to get to them with the smaller old caps in still. was able to squeez a screw driver in with out removing it. tight against the heat sink. I used my pry tool for soldering. Board removed with hot desoldering iron ready!! First Replace the resistors near the caps, these are R720,721,820,821,920,921. R820 and 821 notice how much bigger the caps wil be compared to the old ones !! 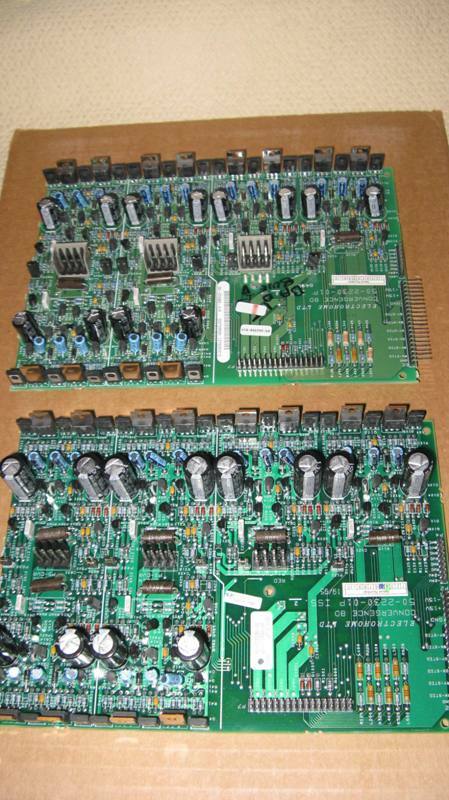 My board R721 for example has the piggy-backed resistors - replace with a single or replace with piggy-backed? I think MP recommended piggy-backed but don't have time to check, late already.........! Outta here.